The Taiji Circle is such a great graphic! In one elegant and simple design it conveys so much meaning. A circle with an S curving through the middle, one half white, the other half black, and each side with a dot of the other side’s color in it. Seems no matter how long this symbol has been a part of my life, the meaning to which it points goes ever deeper. The symbol refers to the yin-yang philosophy that the dualistic nature of all that we see in the world can be understood not as mutually exclusive contrary opposites, but as complementary to, arising from and dissolving back and forth into each other. Night becomes day, summer becomes winter, etc. Yin and yang are qualities, or aspects of things, they don’t exist on their own. No thing that exists, exists in isolation or absolutely. And therefore, no one thing is yin, and no one thing is yang – but everything may be yin or yang relative to something else. And the same thing maybe yin in one regard and yang in another regard, relative to a single other thing. It’s just not as simple as black and white. Seems to me the human challenge is to recognize the harmony among the opposites. Black and white relate to one another, and black and white have the seed of their opposite within. I find this incredibly valuable to remember – especially when I am in what feels like conflict with someone else. Whatever I feel is in opposition, I first notice the seed of that in me, in my position, and then I remember that my position exists in relation to theirs – this gives me the ability to accept their position, without abandoning my own and points the way toward some resolution reflected in the greater whole. Right! The greater whole – the circle in which all this dualistic interplay is happening. For ultimately, there is something which cannot be talked about or described, because it is not subject to the yin and yang of life, but encompasses them both. For me, this is where blogging stops and the practice of taiji begins. Moving through 108 moves of my taiji form, I feel the harmonious interplay of all the seemingly opposing forces – up and down, advance and retreat, form and emptiness, mind and body, and on and on and on….. 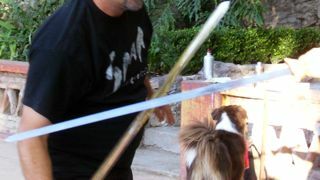 I write these blogs to help me digest my own taiji lessons, to share my journey with my students, and to possibly, provide some entertaining and sometimes enlightening reading for other travelers on the mind-body-spirit connection journey. Why call it The Next Move? I decided to call this whole blog thing “The Next Move” for a couple of reasons. Another reason has to do with the taiji class experience. 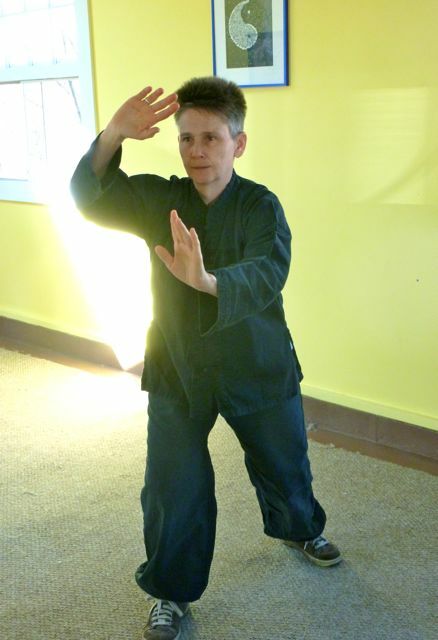 While learning the 108-move long form of Yang’s style taijiquan, there are many opportunities to study and practice the move we are learning. And there is also a feeling of anticipation and excitement about learning the next move. I wanted to bring a little bit of that excitement to this blog. So, as I go forth into my next move, I hope to keep what I’ve acquired – lessons learned, goodwill, some peace of mind, and let go of what no longer serves – all the worries and fears, doubts and expectations. I am finding it is not so easy to start blogging again after such a hiatus. I wrote a long essay about receiving (zou jin) and some of it’s applications in life, and then I had all these second thoughts about publishing it. Though I received some reassurance from trusted sources, still I couldn’t settle in my decision. Too much detail about other people and events in my life, I just didn’t feel comfortable publishing it all. And that is my lesson for the moment. I like feeling settled in a decision – big or small. And so, when central settle eludes me, make a change, do what I need to do to get comfortable. Find my ground, my root, my central equilibrium. Come back down to earth. So, it is a rocky start, but like any practice, I know if I keep at it, it will get easier as I go along.